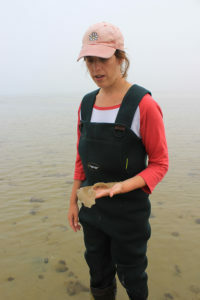 It was a foggy morning and I was very excited to be finally meeting Alyssa Novak, from BU’s Earth and Environment program. The team was by the water’s edge in Wellfleet. 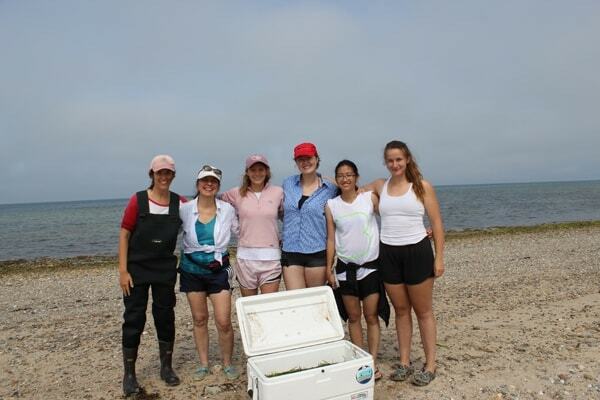 Alyssa was surrounded by students as she showed the different parts of kelp she had found. It was a broad leaf semi transparent slippery thing. 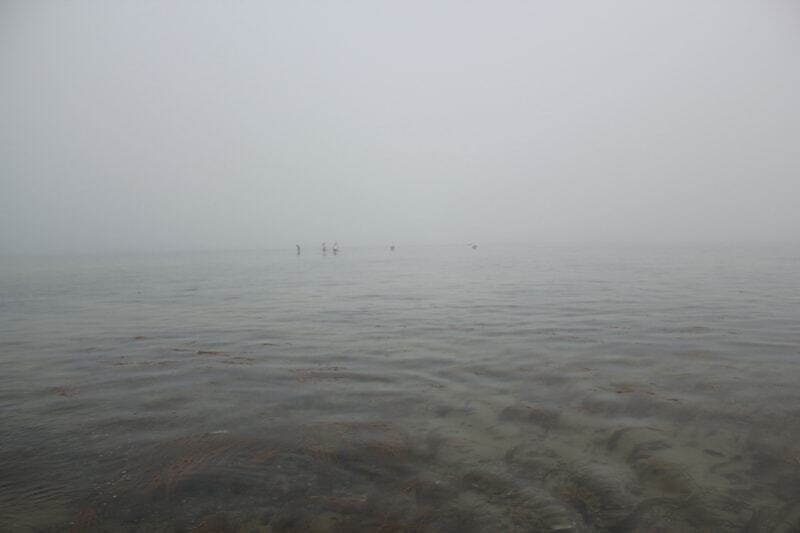 The water felt 10 degrees warmer than Gloucester. The terrain here in Wellfleet was sandy with colorful rocks and lots of different types of algae. The seagrass was also different than the ones we harvested in Gloucester. These were shorter, lighter in color and seemed to be doing well in shallower water. Interesting how the location shapes things that live in it. 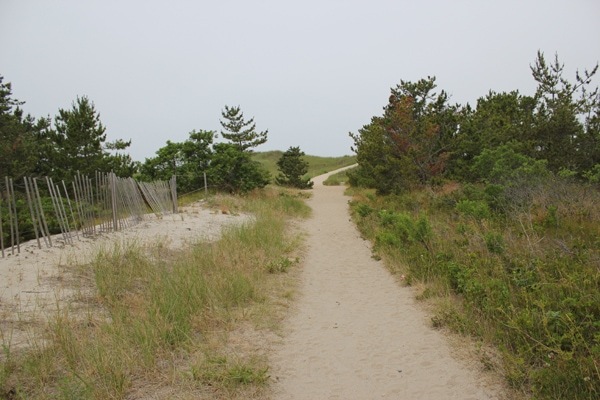 It’s terrific how these ecologists help me see the landscape in a completely different way. Rather than colors, shapes, and forms, all of a sudden I was becoming more aware of smaller details and variations. 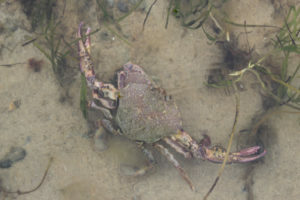 Alyssa had found a small spider crab crawling up another type of algae. 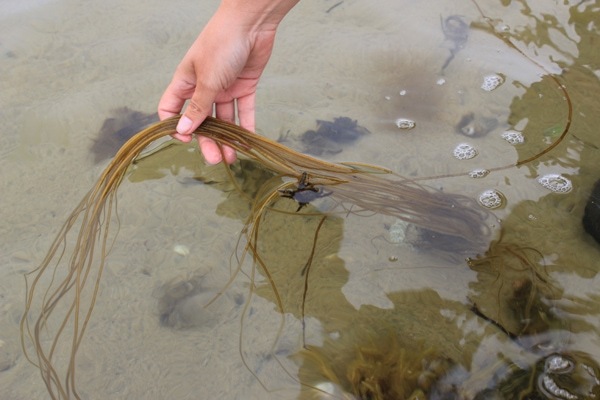 It was long skinny vertical strands of ochre algae and reminded me of long strawberry blond hair. I thought that algae was bad for the seagrass, I see all sorts of algae here. 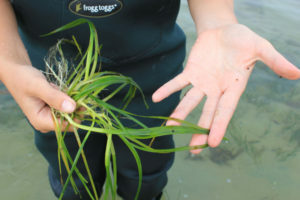 I asked Alyssa , she explains that algae and phytoplankton are only bad for seagrass when there is an excess amount of it and they cover plants or the water becomes turbid reducing the amount of light available to seagrass. This occurs when you have excess nutrients in the system. Under normal conditions seagrass is just as good as oysters for filtering out nitrates. (Nitrates can come from fertilizer run offs & sewage). I remembered Fred Short mentioning how we need to think of our nitrate footprint just as much as our carbon footprint. The team started harvesting the seagrass, Hanna had found a beautiful pink crab (Ovalipes ocellatus). It had a wonderful warm pinkish color with leopard patterns on its shell. 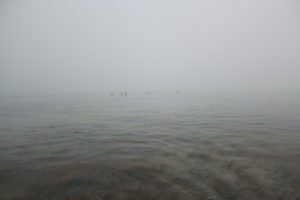 As I walked towards the shore to put my camera away the fog started rolling in and within seconds got really dense. I couldn’t see anything, so I just kept walking hoping there was less water so I knew I was heading in the right direction. I looked back the team had disappeared in this grayish white mass. The fog was so dense I could hardly see a foot away. Interesting how I had to shift from vision dependency on to using spatial knowledge..no gps, no cell phone..makes you wonder how our DNA is configured to help with navigation. I managed to find the shore (phew), put my camera away, and got back to harvesting seagrass. This type of experience would have never occurred if I had just stayed in my studio. The tactile learning that happens when you are out in the field is priceless. I am grateful for having such wonderful people like Alyssa, Hanna, and the team for sharing their knowledge with me. 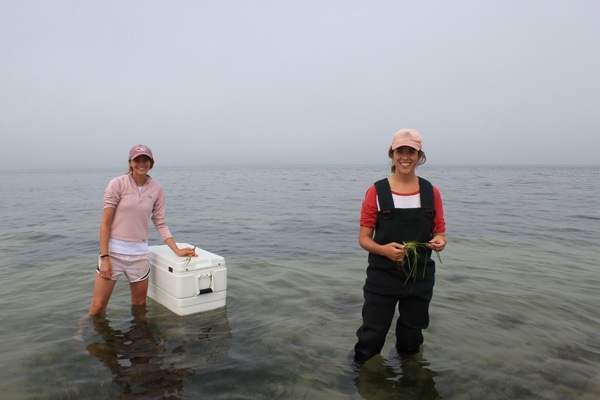 By the time we finished harvesting, the cooler was full of short eelgrass and the fog had rolled out. Yet another fascinating day meeting Alyssa Novak and hanging out with the crew!! !